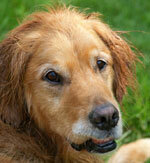 There are new ways to treat canine arthritis! While the geriatric population is affected more frequently than younger dogs, canine arthritis can begin at a surprisingly young age. As canine arthritis progresses, the management of decreased mobility and pain becomes increasingly more important and the success or failure of that management can become a matter of life and death. This article will present several strategies which can help ward off canine arthritis and reward you and your four-legged friends with long, healthy, active lives to enjoy deep into their geriatric years. Osteoarthritis is a gradual abnormal wear and tear of the joint surfaces which normally cushion and protect the bones of the joint. Osteoarthritis causes inflammation, pain and decreased range of motion. The wear and tear can be caused by a variety of source such as poor conformation, joint instability, obesity, injury to the cartilage or joint surfaces, or abnormal use of the joint. It is important to realize that a normally performing, uninjured joint that has congruent joint surfaces, will not become arthritic. However, even a micro-variances and incongruences can cause abnormal wear and tear of a joint and start the arthritic process. Many dog breeds inherit abnormal joint structure, and therefore, are more prone to suffering the effects of arthritis early in life. For these dogs, healthy eating habits are even more important than for dogs with healthy joint conformation, and it is important to keep their weight down as low as possible to avoid under stresses on already dysfunctional joints. These dogs may also benefit from nutritional joint supplements very early in life. With other breeds, it is difficult or impossible to tell if any of the joints are abnormal until the dog begins showing signs of discomfort. However, weight management is a huge factor in contributing to osteoarthritis and can easily be manage throughout a dog’s life. For all breeds, there are some other universal strategies that can help delay or prevent arthritic changes in the joints.